Finally, the last day on the road! And a leisurely one, too -- I began the day barely 100 miles from my destination, Atlantic City. A few miles out of Lancaster, Route 30 regained its two-lane status, and gracefully skirted the southern edge of Amish country until reaching the Philadelphia suburbs. US 30 then plunged into Philadelphia from the northwest. Later on, as Vine Street, it would run through the heart of the business and commercial district, but out here the surroundings could only be described as slums. Even the road itself was pitted and gouged. Just as the slums ended, the construction began. At long last I reached the historic district. 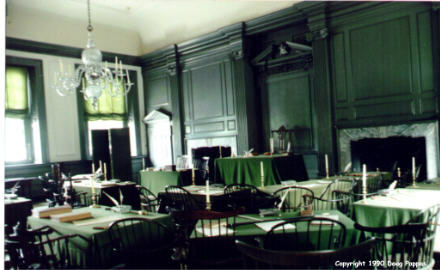 The Independence Hall area of Philadelphia has about the most concentrated collection of major-league American history one could ask. I hadn't seen it in a few years, so I went the full tourist route: in to see the Liberty Bell, joining a throng of tourists on a trip through Independence Hall itself, to the portrait gallery that now occupies the Second Bank of the United States building, and through the Independence National Historical Park visitor center, a modern structure with exhibits honoring the Constitution and the freedoms it brings. I'm surprised that Jesse Helms or some other pinhead hasn't screamed bloody murder at its communistic celebration of diversity. 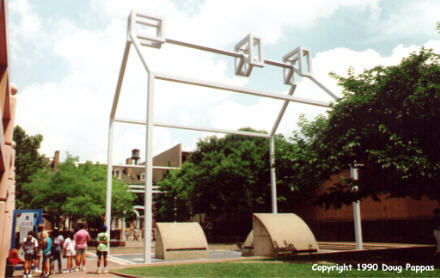 Probably the most intriguing structure isn't a structure at all -- it's the bare steel frame erected on the site of Benjamin Franklin's long-gone residence, outlining the silhouette of the building while displays allow visitors to stare down into the excavated ruins of the Franklin home. While New Jersey indeed has some lovely areas, none of them lie within sight of any major road in the state. The trip between Philadelphia and Camden was certainly better than some of the North Jersey refinery-from-hell viewpoints on the Turnpike, but an endless sea of strip shopping centers doesn't quite set my heart aglow. Then come a few dozen miles of nondescript fields the natives probably consider wetlands -- and finally the five-mile-long strip of billboards that trumpet one's approach to Atlantic City. Since US 30 isn't an Interstate, the billboard-control laws don't apply, and since there are no trees, scenery or even interesting buildings to get in the way, the careful viewer can usually enjoy twenty to thirty ugly, unimaginative signs at a time. But the ugliness of the signs pales in comparison to the ugliness of Atlantic City, the most physically and morally repellent place in America. When casino gambling came to Atlantic City in 1977, it was touted as the key to revitalizing the decaying resort town. Profits from the casinos would be dedicated, by state law, to urban renewal and other causes beyond the capacity of Atlantic City's shrunken tax base; new housing would be constructed; the middle class would return; and Atlantic City would return to its glory days of the 1930s. Ha. The first clue that something went awry comes a few miles out of town, when US 30 straddles a half-mile or so of parking lots reserved for casino employees, none of whom would be caught living in Atlantic City proper. The tall casino hotels dominate the skyline...but that's not good either, since they're all clustered within a block of the Boardwalk, clear on the other side of town. 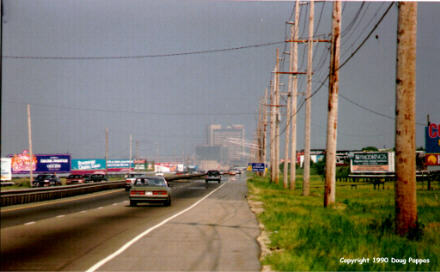 For ten long minutes the driver approaches Atlantic City, looking in vain for some sign of honest life on the horizon. US 30 comes to an inglorious end at the intersection of Virginia Avenue and Absecon Boulevard, a short distance from the casinos. For all the construction and glitz the casinos have brought, this neighborhood looks much as it must have when US 30 was first designated in 1925. Incredible hovels, reminiscent of the tarpaper shacks of the Mississippi Delta, remain within three blocks of the casino district. I couldn't wait to get out of town.